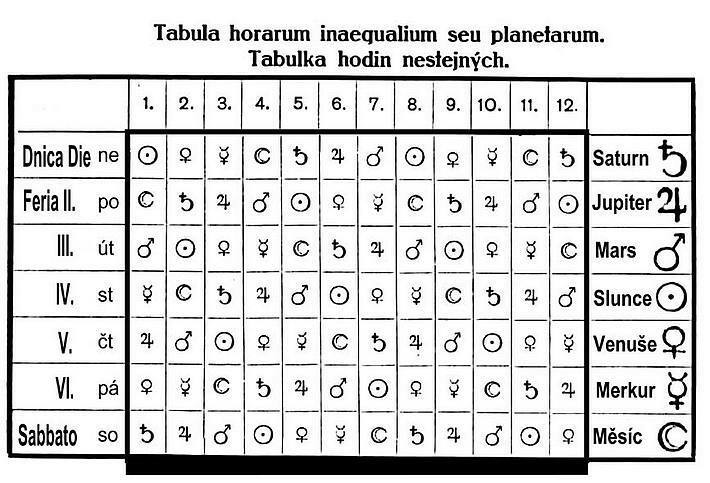 One of the proofs of the dating of the clock back before 1490 was the horoscope made for 17th March 1459, found in Bohuslav Hasiљtejnskэ’s library with an explicit statement that the figures were read on the astronomical clock in Prague. An astrolabe driven by a clock machine, which is how the Prague astronomical clock worked from the moment of its making, is able to show the data necessary for compiling a horoscope. The Zodiac Sign the Sun is in is evident as well as which of the signs is rising over the horizon. Let us consider the curves for the Babylonian time, also called unequal or planetary time, in more detail. In historical terms, it is the most ancient time indicated by the clock. As implied by its name, it was adopted from ancient Babylon. Whenever the Bible mentions time, it is this Babylonian time. The time curves are only marked on the day﷓part of the plate, i. e. in the blue area from the sunrise to the sunset; the areas are designated with numbers 1–12. The Babylonian hours are indicated by the position of the Sun within the numbered field. The hours are equally long within one day but their duration differs the next day because they depend on the interval between the sunrise and sunset and are thus unequal. The night was divided into 12 hours as well, which is not marked on the clock. This datum was not important for common practice; it is only of importance for determination of the planetary ruler of the hour (this applies, of course, both to day and night hours). Here we have entered the field of astrology and so we have to remind the table that was part of the outer appearance of the clock as a fresco painting; it was located above the windows. In 1791, it was partially covered with a sheet metal plate with an inscription celebrating the coronation of the Emperor Leopold II. 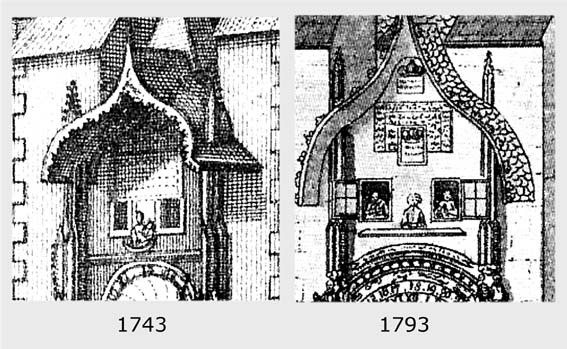 In J. Dietzler’s drawing (1743) it is entirely visible, whereas in 1793 F. and F. Heger drew it already covered. It was finally removed during the great reconstruction in 1864–1865 and later the cockerel appeared in its stead. We reprint it from V. Rosickэ’s book with slight updating additions for better readability. This table requires more detailed explanation. Astrology was developed in Babylonia. It was also there that the days were arranged to seven﷓day weeks, whereas each of the then known planets was assigned one day. The Sun and the Moon were also considered as planets, so they constituted seven “planets” together with Mercury, Venus, Mars, Jupiter and Saturn. These were also rulers of individual hours; the rulers took turns one hour after another and this variation continued over the entire astrological year. The rulers are indicated on the table for daytime hours 1–12 horizontally and for the days of week vertically (from Saturday to Sunday). It is sometimes said that our ancestors were only interested in measuring time in hours. This is not quite exact as they were able to read the time with the precision of several minutes. However, when determining the planetary time, only one hour and its ruling planet were of importance. It was important e. g. for the compilation of a horoscope. Let us take notice of the first row and the fact that the table begins in the upper left corner with Sunday and that it is the Sun who rules the first hour of the day. Logically, the row after the 12th Babylonian hours should normally continue with the rulers of night hours (Jupiter, in this case). The continuation is not present here, probably because the table would be too extensive and poorly readable. They however resolved this by subtracting the rulers of night hours in the row four days later (i. e. on Thursday, which begins with Jupiter). Determination of shorter intervals at night was resolved even before the invention of the wheel clock. Let us remind sandglasses, water clocks, flame clocks with oil, alcohol or candle and also make reference to wide variety of literature. During the preparation of this chapter, a question emerged why there is no mention of the Prague astronomical clock in the works of such astronomical personalities as Brahe or Kepler (or, strictly speaking, there is no known mention) although they lived and worked in Prague in the times of their greatest renown. In our opinion, they were not interested in such an inaccurate and informative indicator. They were professional astronomers and they had tables and measuring equipment of high precision, considering their times. Nevertheless, Kepler is known to have compiled some horoscopes. In the end, we remind Czech naming of the planets, created by Karel H. Thбm at the end of the 18th century, in the era of National Revival. Jupiter was Krбlomoc, Mercury – Dobropбn, Mars – Smrtonoљ, Saturn – Hladolet and Krбsopanн meant Venus. The word “Noиena” for the Moon (after the name Luna) seemed quite queer even in the moment of its creation but the other names occasionally appeared in texts or poems of that time. These words “disappeared” in the course of time. Maybe some confessor of mysteries will use them once again, that is also why we remind them.